An Interview with Kyle West and Jelani Sims | We Zombie! 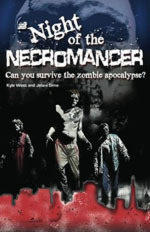 Kyle West and Jelani Sims co-authored a great choose-your-own adventure book called “Night of the Necromancer: Can you survive the zombie apocalypse?” They’ve taken the format into the zombie apocalypse genre and created an outstanding work of art. I reviewed the book and was impressed with the amount of effort required to put the book together and I wanted to know more about the authors and what the process was like. What follows is an interview that took place through e-mail over several days – hope you enjoy it as much as I did. Q. I want to say thank you for agreeing to answer questions about your book, Night of the Necromancer. I really enjoyed the book – not just the storyline, but also the fun of making my own decisions along the way through the story. How did you two come up with the idea to write a book about zombies in the choose-your-own adventure format? JELANI: Kyle originally had the idea to combine zombies and the choose-your-own adventure format. And I told him that it was a totally cool idea and I totally wanted to be involved. I love the horror genre and the copious amounts of gore that come with zombie territory and so ideas just naturally flooded into my head. The characters, settings, and situations were all pulled from the zombie movies and video games that we both loved and so writing the book was one of the most fun experiences that I’ve ever had. And, it was really easy, looking back on it all. KYLE: The original idea came when I was just laying in bed, and had the thought of “What would I do if zombies attacked, RIGHT NOW, at my apartment?” It’s a thought I’m sure zombie lovers the world over have wondered – whether if they were attacked, whether they could survive. As I played out the scenarios in my head, I started to write them down. Then I realized that this could turn into a choose your own adventure. At the time, I didn’t know that it would turn into one of the largest/most unorthodox choose your own adventures ever made – I had envisioned it as a short project that I could put on a blog or something. I kept writing until about page forty when I told Jelani about my idea. Jelani and I are both professional writing majors at the University of Oklahoma who have had a lot of the same classes. When he was just excited about it as I was, he offered his help, and that’s when things really took off with the book. We decided to plan and then write the book together, and tt became more of a reality than just a side project. It took a couple months to plan the choices, about a year to actually write the thing, and about another year to edit, format, and publish it. Two years later (it really did take that long), the book was published through Kindle. Q. As I started reading, I couldn’t help thinking about how much work was required to put this book together. It’s a lot of work to write a story, but I can’t imagine how you go about creating a choose your own adventure book. Do you agonize over the breakpoints: where to put them, are there too many, too few, etc? Can you tell us a little bit about the process? JELANI: The process started quite simply. We thought about our favorite things from zombie video games and movies. We wanted the story to take place in apartments, grocery stores, cities, forests, and airports. We knew we also wanted a twist to our story that made it different, so we brought in the Necromancer character. Then we plotted out each scene by the decisions the reader would have to make in each scene. After that, we spent hours drawing out the whole story on a giant sheet of paper, which we then made copies of for each other. That took a couple months to finish. Our writing styles melded pretty quickly during the writing process. Kyle was really impressed with the first scenes that I wrote and we decided to take the direction of the story in that direction, using lots of detail, tension, and character development. In the end, we came out with a choose-your-own adventure tale that we felt was unique and original. The hassle of writing a choose-your-own-adventure piece was having to sometimes write the same scene two or three different times with varying outcomes. Sometimes, Kyle and I gave scenes to each other that we were tired of writing so that the other could put a fresh eye on it and so neither of us would get burned out. Q. There is a character in the book called Regina, who reminds me of a girlfriend I once had. I found myself hoping Regina would become a zombie, so I could shoot her in her annoying little head. As you wrote the story, was there a time when you wanted to kill off Regina also? JELANI: Yes! We definitely got satisfaction out of turning Regina into a zombie in several versions of the story, and in a more morbid turn, getting rid of her in a car fire. But, ironically, Regina was also one of the favorite characters during the writing process. When writing each scene, we made sure that Regina got more and more annoying. We made her complain, whine, burn with jealousy, and endanger the group with her overall selfishness, and she always gladly obliged to our wishes. Now, Regina is a source of pride for us. We are delighted that everyone who picks up the book wants to kill her! And, we are getting even more mileage out of her on our blog where we are featuring her in her own weekly choose-your-own adventure. KYLE: Poor Regina…we gave her such a bad rap. Regina actually does get killed off quite a bit, and even becomes a zombie a couple times during the book. If you haven’t read that part, you just did a very good job of protecting all your party members. There are four main story arcs that reach an end other than death – and two of those four involve Regina not making it. But I can’t remember writing a part where you actually get to SHOOT her. In retrospect, that might have been a very satisfying decision for some readers to have made. While Regina is built in such a way that she immediately disliked by the reader, I at least have a sense of attachment to her – maybe it’s because I came up with her character. That might be why I let her survive as much as she does. But I have to admit, even though it might not sound very nice, part of the fun of writing the book was coming up with new and interesting ways for her to die. It should be noted that I did kill Regina off several times, it’s just that I never got to shoot her in the head myself – very disappointing. Q. For those out there wanting to create a book, how hard was it to get published, sold on Amazon, in the bookstores, etc. In other words, which was harder, creating the book or releasing the book? JELANI: Anyone who is looking to independently publish on the internet should be prepared to pull their hair out the first time they do it. If you do the process correctly, it requires a lot of editing, patience, and trial and error. As far as the process goes, Amazon.com and BarnesandNoble.com walk you through every step of the process and make it relatively easy to finish the process successfully. But, since there are no editors or other people on your team, doing all the editing, formatting, and work by yourself, it can definitely be nerve-racking. KYLE: Kindle is a great way for any author to get their stuff out there. It’s very easy, and it and Create Space (also through Amazon) are the best way I know of for someone to self-publish. As Jelani said, the main drawback is doing your own editing, finding an illustrator, and doing your own marketing. It’s a lot of work, and normally a publishing house would be taking care of that. But I think for our book in particular, it was a good decision to go with the Kindle – we’re still learning, and when we write our own stuff in the future, we will probably opt to go the traditional route. But as far as anyone thinking about doing Kindle, it’s a very good option. There’s a lot of benefits, but there are also drawbacks as well. Q. Do you think a zombie apocalypse is inevitable or likely? If so, when will it happen. I’m talking not just about corpses rising from the dead, but also perhaps viral or bacterial infections causing psychosis, or maybe nanotechnology controlling our brains in a malicious way. What are your thoughts? JELANI: I definitely think the zombie apocalypse is coming. There are too many ways that it could happen. One highly plausible cause of the apocalypse could be human contact with cordyceps fungi. Cordyceps fungi only affects animals as far as our current knowledge goes, but there are hundreds of types that specialize in different species and there could easily be a type out there that affects humans. The parasitic fungi take a hold of the host brain and force the creature to migrate to a place where the fungus can grow. The fungus then kills the host and grows from its body to spread again. If humans contracted this fungus, they would be walking around under the control of the parasite, causing the deadly spread of the fungus until no one was left alive. I do like the idea of nanotechnology zombies as well. Perhaps the Necromancers of the future will use such means to take over humanity. You never know. The only thing we humans can do is prepare for survival, no matter how the apocalypse starts. KYLE: I don’t know whether one will come or not. I surely hope not. But you never know – this world is full of many dangerous things. New species of parasites are discovered all the time – perhaps one of these would be able to control a human being. Another possibility is also viral – it would be similar to rabies, but a lot more deadly, and it would of course target humans. But I think the most likely way a zombie apocalypse would occur is through nanotechnology. In the wrong hands, a mad scientists or terrorist group could use this technology to develop micro-machines designed to replicate and spread themselves by controlling the human brain. This also implies a possibility that this zombie horde could be controlled from the outside. This would be a truly horrific scenario, though it is not out of the question. Perhaps our very government is working to develop such frightening technology, intending it for military purposes. It’s not too hard to imagine such a concept going awry. Of course, we should always be prepared for any one of these eventualities. Q. Was the choose your own adventure format popular when you were growing up? I seem to remember a time when that was a hot format and there were many subjects to choose from. KYLE: I did remember enjoying the format, but the only real exposure I had was R.L. Stein and Goosebumps, which I think is the same for Jelani. I remember reading a book called Tick Tock, Your Dead, where you had to travel in time, and I thought that was kind of cool. I always had fun doing them. I don’t know if they were an inspiration or not – maybe they were subconsciously - since I only read a few. I remember in high school I would sometimes write “mini-choose your own adventures” just for kicks and have my friends read them. They were mostly random and not really genre specific. Night of the Necromancer is actually my first real foray into the horror/zombie genre. It’s been really fun, and I definitely hope to continue writing some more of the same type of stuff. JELANI: I grew up in the ‘90s, after the Choose-Your-Own-Adventure book had had its heyday in the ‘80s, but I do remember reading the Goosebumps choose-your-own-adventure books that R. L. Stine wrote. They would always scare me because I was sure that every decision I made would lead to my death and most of the time I would just put them down, fearful of what would happen next. When I started writing Night of the Necromancer with Kyle, I even pulled out some of those old books for inspiration. I think it’s also worth mentioning that the genre is starting to come back in this new decade. I see chick-lit books written in the format, fantasy genre mash-ups, and even other horror choose-your-own-adventures that are similar to ours. This excites me because it’s kind of like being in the first wave of people that reintroduces a genre to a new generation of readers as well as bringing it back for the old. Q. When the zombie apocalypse comes, do you think you will be a survivor? Why? KYLE: That’s really hard to say, because it depends on so many factors – where you happen to be when it comes, how much preparation you have beforehand, or whether you see it coming. I have read Max Brooks’ excellent primer on zombie survival, so I at least know the basics – and that should give more of an edge than most people. Given that I have advance warning and some time to prepare, I think I’d be okay – at least for a little while. I have some friends that are pretty into zombies and survival in general, so I’d definitely be taking them along with me. I’d probably hole up on an offshore oil rig or a large sailboat, or have a self-sustaining fort out in the middle of nowhere. JELANI: Part of me says that I would be a great survivor. I’ve played Resident Evil since the ‘90s. I’ve seen tons of zombie movies and have learned a lot of the survival tricks. I have a copy of Zombie Survival Guide and World War Z to give me guidance as well. Yes, part of me says that I’ll definitely be a survivor. But then there is also this part of me that knows that the minute a zombie knocks down my door, I’m probably going to get bitten right in the jugular. Q. What is your next project going to be? Are there any more choose your own adventure books in the works? KYLE: Jelani and I are planning a sequel. This one is more his brainchild than mine, so it’s exciting to see the direction he’s taking it. It will definitely have a similar feel to the original, but there is definitely a twist to it. We’re sort of branching out the decisions right now. We don’t really have a set date for it – but it shouldn’t take as long as this last one since we know more of what we’re doing. JELANI: I have several projects I’m working on or thinking about, in both the sci-fi and horror genres. I even outlined a paranormal romance recently, and I laugh at myself when I think about it. I’m a young writer right now, and I’m just exploring all different types of stories, seeing which elements work best for me and then bringing them all together to add something unique and interesting to the horror genre. There is nothing new under the sun, but I’m looking to be as original and open-minded as possible when it comes to my writing. There is also a sequel to Night of the Necromancer in the works as well. Kyle and I are really excited about it because we feel we will be adding something new to the zombie genre and allowing our readers to step into shoes that they most likely never thought they could fill before. It is definitely going to be really interesting and fun. Q. Which authors have influenced you the most, or are there authors you aspire to be like? KYLE: I grew up reading mostly fantasy and sci-fi. I was really into Lord of the Rings, The Wheel of Time, Redwall, and other fantasy and sci-fi stuff. I also liked Stephen King, specifically The Stand. I also read a lot of random historical fiction based books, like Edward Rutherford’s London and Colleen McCullough’s First Man in Rome series. I also read most of Hemingway’s novels. There’s also a lot of stuff I read that I can’t remember, but undoubtedly shaped me. I was always reading something. Nowadays, I’ve branched out a bit more. I really like the classics, and have recently discovered Dostoevsky, Dickens, among others. I’ve also taken a liking to poetry. As far as admiring certain authors, I have a few. As an aspiring fantasy author, I definitely admire Tolkien– what that man did continues to boggle and amaze me. I would love to write like Bradbury or Steinbeck though – both really make me think, and that’s what I want to do with my writing. JELANI: One of my first big influences was R. L. Stine. I started reading Goosebumps back in ’96 when I was in the first grade. I was completely inspired by him as a young kid and started writing because of him. These days, I often tell people that my aspiration is to be the black Stephen King. I say it often as a joke, but I really mean it at the same time. Thus far, I haven’t really seen an African-American author that has been iconic in genre fiction, especially horror. There are these modern horror greats that I love: Stephen King, of course, Clive Barker, Wes Craven, John Carpenter, and so on, but none of these authors truly think like me, look like me, or represent the voice of my background or culture in the genre. So, I aspire to be like these authors because I want to stand in their ranks and add a new picture of what the Great American horror writer looks like. I’m really looking to be prolific, write great fiction, and relay a personal message to the world through the genre, like the men I mentioned above have done. Q. I just want to say thank you to both of you for answering questions about your book and your writing. It is much appreciated. Is there anything else that you like to say to your fans or perhaps any would-be authors out there? JELANI: To fans I would say: Tell people to buy our book and leave wonderful reviews on Amazon! Honestly, I would tell them thanks for all their support and I look forward to telling them many wonderful stories in the future. To would be authors, I would say that there are so many options out there for getting published these days and they should explore them all. And, keep writing and read, read, read. KYLE: You’re very welcome Bill and we’re glad to have had the opportunity to talk to you. To my fans, thank you very much for your support on our first book. It’s been very encouraging to hear stories of people being excited about reading the book, and people you’d never imagine enjoying it having a blast reading it. To the would-be authors, I will echo what Jelani said: a writer has to be a reader first. Read widely, and read all the time. Always be reading something – fiction, nonfiction, literary and genre-related stuff – and write what you love, with love. Write even if you think you won’t be successful “out there” – write for writing’s sake, because that’s what writers do. Focus on writing the very best you can and be prepared for long hours, perhaps with little to no reward. And then, do your best to get it published. Whether you go with Kindle or the traditional route of finding an agent and a publisher, remember that it’s a process. Even J.K. Rowling was rejected quite a few times for Harry Potter. Just keep on trucking. here at net, however I know I am getting familiarity everyday by reading thes good content. Sometimes the grading may involve more than three contractor years. They must demonstrate excellence in the same time. I agree – Kyle and Jelani provided some great insight into their writing and the process of creating the book. It was a fun interview.